West Monroe, LA – Custom guns shouldn’t have to ride in stock trucks. So Superlift decided to increase the firepower on Red Jacket Firearms’ “Sons of Guns” company trucks. Red Jacket’s “War Wagon” 1986 Bronco and “Light Recon” 1996 Mitsubishi Mighty Max have custom bumpers and racks made byMetalforms USA. Underneath, Superlift outfitted the Bronco with its full 4-inch Twin-Traction Beam lift system and Superrunner steering correction kit. The Mighty Max has custom Superlift spring spacers. Both rigs haveRamsey winches, KC HiLites driving lights, Interco tires, American RacingATX wheels, Yukon axle gears, Magnaflow exhausts and Kicker sound systems. Both rigs are well-equipped for firearms testing. The Bronco is shown here with a .50 caliber rifle. It’s set up to safely carry 3,000 rounds for the rifle. Other touches include battle-armor panels and provisions for grenade launchers, smoke-bomb launchers, and rocket-propelled grenades (RPGs). The Mighty Max mounts an MG42 machine gun, which can be easily swapped out for a .30 Cal. The truck is also equipped with grenade launchers and storage for 3,000 rounds. 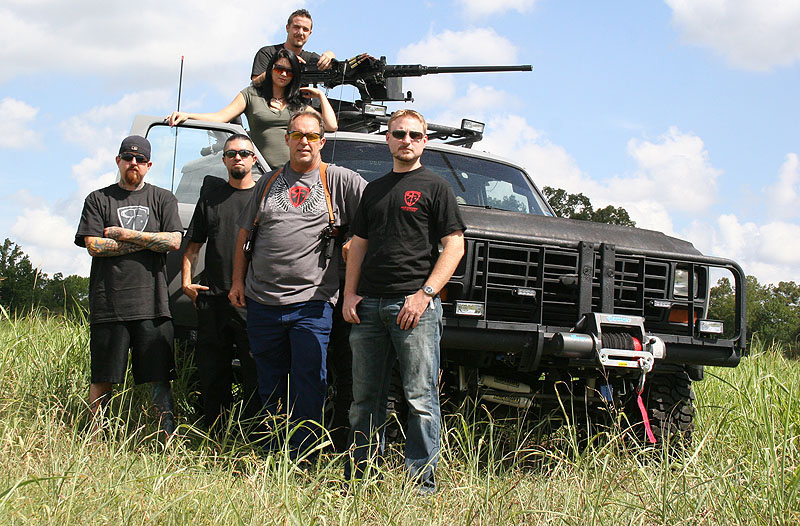 “Sons of Guns” airs Wednesdays at 9 PM EDT on the Discovery Channel.